If the educators are willing to develop their reflectivity on what they have habitually considered genuine, the teaching may transform them into professionals who are vitally open to the students and to the world. 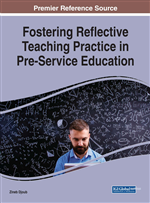 For that reason, the first part of the chapter concerns the process of becoming reflective educators whereas the consecutive section introduces teacher journal as a means of developing reflectivity. The next part of the chapter comprises a study which is an attempt to analyze and describe the data gathered from the entries in teacher journals. An additional effort will be made to examine which elements of the classroom interaction are influenced and which are ignored by teachers during the process of reflective development. The chapter ends with conclusions and suggestions for further research directions. In 1671, Tsunetomo wrote Hagakure which was a manual consisting of a series of short reflections for the samurais. The author claims that with time people develop their reflectivity and awareness of the environment surrounding them. They start to notice their own insufficiencies and can also see the insufficiencies of others. What is more, as they advance daily and become more skillful they start to understand that the process of self-improvement is never-ending (Tsunetomo, 1671). These words may be considered as an illustration of the seventeenth century reflective approach. A similar approach can be found in the words of Rogers (1969), who said that: “The only man who is educated is the man who has learned how to adapt and change; the man who has realized that no knowledge is secure; that only the process of seeking knowledge gives a basis for security” (p.104). Traditional understanding of teaching as a rather passive transmission of knowledge or providing the students with information seems to be exceedingly derisory. Therefore, in the contemporary foreign language classroom educators need to assist and help learners in coping with educational challenges. In order to do so, teachers need to adopt new, alternative roles of guides, helpers, prompters, facilitators, and mentors. While assuming such roles, teachers need to increase their awareness of the global character of the enterprise, foresee the future actions, and understand the steps which are necessary for achieving educational goals (Dakowska, 2001). Stevick (1980) believed that it is essential for teachers to develop their personal and professional reflective awareness by taking into consideration what goes inside and between their students. Furthermore, he advised pedagogues to get to know their students’ psychology, treat each of them as an ordinary person, since by doing so they will learn about their students’ attitudes to learning and their motivations. Contemporary teachers need to develop reflective awareness and communicate openly and emphatically with their students. They need to become reflective practitioners who will not only understand themselves better, but will also set the stage and context for successful learning. Therefore, in order to make the process of language learning and teaching more student-centered and efficient, educators need to increase their reflectivity and awareness of themselves as well as of their students. Sometimes, even teachers who are aware of the ongoing changes refuse to change their teaching routines. As Appel (1995) writes: “An emphasis on change does not necessarily combine well with one on practice. The practicing teacher’s resistance to educational change has often been the subject of complaint” (p. xiv). The problem may be even bigger taking into consideration the fact that teachers are often convinced that they are ‘doing their job’. However, there is a significant difference between: ‘I do not know’ and ‘I think I know’. Therefore, the main objective of this chapter is to investigate the influence of journal writing process on the development of reflectivity among foreign language teachers and assess which elements of the classroom interaction were reflected upon and which were neglected during the process of reflection.